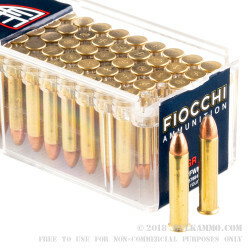 The premier case lot of hunting ammunition for the .22 WMR from Fiocchi. This is a case of 200 rounds of the 40 grain soft point .22 Winchester Magnum Rimfire cartridge. This is a round made for small game hunting that truly outshines other market offerings not just from a performance perspective but also in a price point comparison. 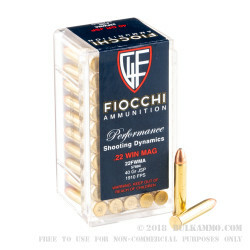 The Fiocchi line of products tends to already be very value focused given the incredible performance they offer, but this is a cut above on both points. 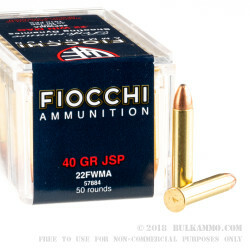 The 40 grain projectile is a soft point which offers a bit of deformation and helps with the impact on target. The fast-moving bullet exits the bore traveling at 1910 feet per second and offers 324 ft. lbs. of energy. This round is clearly suitable for most of the small game and even some intermediate game animals from small birds and squirrel to rabbit, and coyote at closer distances. The significant energy delivery of the round offers good stopping power for most small game. 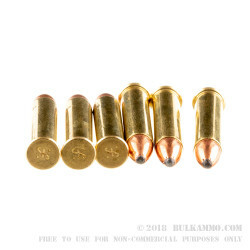 For the newer concealed carry revolvers and derringers on the market, this is also a very good choice with the soft point projectile and the sizable ballistic numbers.